Chromatic aberrations themselves are relatively easily to reduce or remove altogether in post-processing and I have detailed two different methods of dealing with this problem. 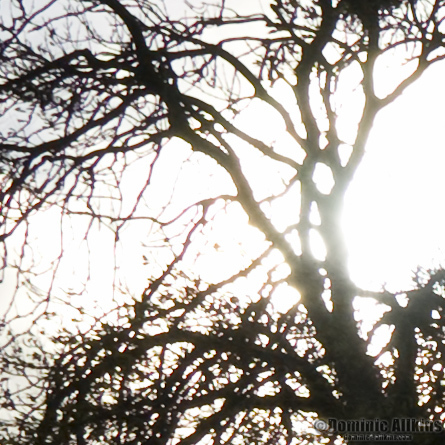 You are most likely to find chromatic aberrations around areas for high contrast such as, in this case, the backlit tree. This effect is caused by the way lenses deal with the light passing through the lens and hitting the sensor. In fact, if you read most lens tests online you’re almost certain to read about how much the lens suffers from chromatic aberrations. 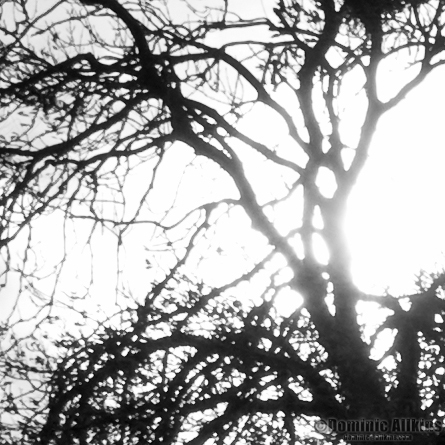 In fact, the test is often carried out using a backlit tree like that shown in this picture. The better the lens, the less likely you are to see chromatic aberrations. This picture was taken with the Sony Carl Zeiss 16-80mm standard zoom lens which despite being a very high quality lens still shows this problem. There are a number of ways of dealing with chromatic aberrations, depending which software you use. 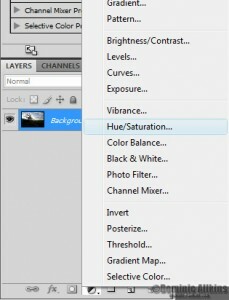 Since I take all of my photographs in RAW format I tend to use the tools available in Adobe Camera Raw CS4 (ACR) or Adobe Lightroom 2 (the tools are the same for both pieces of software) for fixing this problem first which normally give a very good result. If I’m not entirely happy with the result from ACR I’ll also try fixing the chromatic aberrations with Photoshop CS4 as well. In this picture, the results from Photoshop were better so this was the final approach used for this photograph. The tools for fixing Chromatic Aberrations in ACR/Lightroom are found in slightly different places; either in the ‘Lens Corrections’ tab in ACR or the ‘Detail’ tab in Lightroom, but the tools are the same. 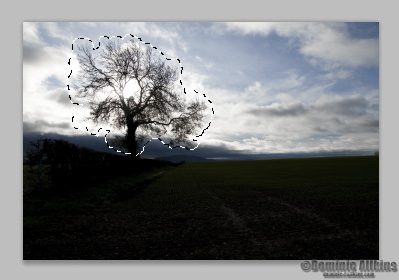 The screengrab below (from Lightroom) shows the tools while the following two images show a 100% crop before and after correcting with ACR/Lightroom. We can clearly see that the chromatic aberrations are better after attempting to fix in Lightroom, but there is still some fringing evident around the branches. 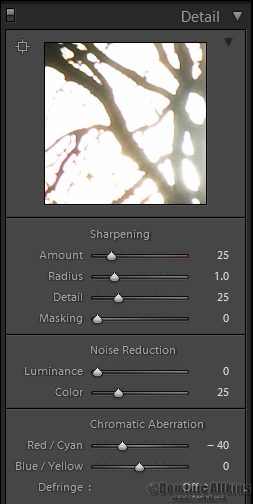 Because of this I attempted to fix these in Photoshop CS4 directly. 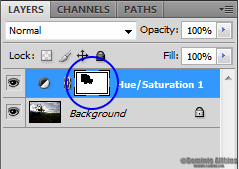 Step Two: I created a Hue/Saturation adjustment layer by clicking the half black/half white circle at the bottom of the layers palette. 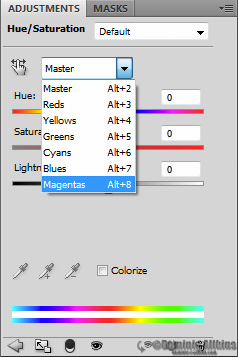 In the Hue/Saturation tab, I then selected Magentas from the Edit drop-down. 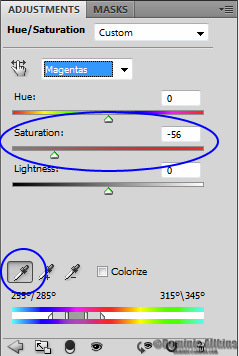 Then, using the colour picker tools I clicked on an area of purple fringing in the photograph and dragged the saturation slider down – in this case to a value of -56. Step Four: The final step was to make sure that I didn’t de-saturate the selected colours in the rest of the image using a layer mask. This is easier than in sounds. With the Hue/Saturation layer selected, I made a selection around the tree using the lasso tool and then using a large black brush painted over the rest of the image. If you do the same this is what you will then see in the layers palette. The area in white around the tree has been masked out and the Saturation adjustments are not applied to the masked area. Below are comparisons of the results from Lightroom 2 and Photoshop. You can see that the final result from Photoshop is better than that directly from Lightroom 2 which is why this technique was used. If you are using other software you should be able to easily find online the best approach to removing chromatic aberrations with your software. Once the chromatic aberrations had been fixed, it was time to sort out the dynamic range issues which I’ll detail in the next post. This entry was posted on Sunday, August 15th, 2010 at 06:10 and is filed under Blog, Post processing. You can follow any responses to this entry through the RSS 2.0 feed. You can leave a response, or trackback from your own site.